Writing for Vice earlier this week, Natasha Lennard argued that, while newsworthy, the People’s Climate March should not earn the title of historic: “Taken in isolation, mass marches — even when truly massive — do not history make.” Lennard’s analysis is exactly right, but it doesn’t apply to this past weekend’s events. Try as they might, journalists struggled to find a story that fit comfortably into a so-called “mainstream” environmentalist framework — that is, one friendlier to market-based solutions than it traditionally has been to black, brown, working class and otherwise marginalized communities that fall within the “sacrifice zones” of an extractive economy. Sunday’s 300-foot long banner emblazoned with the words “Capitalism = Climate Chaos” didn’t hurt, either. The process for bringing the March together — while unprecedented in the mainstream climate movement — is one that could have happened years ago. For seemingly obvious reasons, those who are most effected by climate change and extraction have been the first to respond to those forces. From labor struggles to indigenous resistance, the “environmental” movement extends back to well before Earth Day or Rachel Carson’s Silent Spring; now isn’t the first time these companies have been on the wrong side of history. In 1960, the NAACP organized a national boycott of major oil companies over their participation in blacklists issued by racist White Citizens’ Councils. Coal miners in Appalachia, Pennsylvania, Colorado and elsewhere fought some of the most militant labor battles in U.S. history against the fossil fuel industry throughout much of the 20th century. The groups involved in these generations-old struggles should have been at the table years ago. Late as it may be, this week’s very public shift towards a more thorough economic analysis of the climate crisis is a positive and, yes, historic turning point for a movement that for too long has been mired in top-down strategies and market-based reforms. This shift has come from below: from community-based organizations fighting incinerators, pipelines and fracking at their source, to students on college campuses demanding their schools divest from the industry that’s stealing their future. As march organizers predicted, the People’s Climate March was the largest climate demonstration in history; labor unions, religious denominations, college students, scientists and more all turned out in force — the latest estimates on participation exceed 400,000 people. The issue is that the kind of climate movement prefigured this past week should be setting its sights even higher. Take what may have been the two largest mass mobilizations of the last decade: the anti-war and immigrant rights movements. In 2003, protests against the war in Iraq swelled to 400,000 in New York City alone, with millions more rallying around the world. In 2006, the immigrant rights movement brought nearly a million people into the streets nationwide to fight the passage of HR 4437, a regressive immigration reform measure that passed in the House, but failed in the Senate — in large part thanks to mounting popular pressure in the streets and at the community level. Similar to those demonstrations, the success of the People’s Climate March will be determined in the weeks and months that follow it. Ironically, the right wing media may have walked away from this week’s events with perhaps the clearest understanding of the situation at hand. According to Newsbusters, a conservative online news outlet, there were “no shortage of Gotham protesters often uncivilly advocating an end to capitalism and its replacement with ‘a socialist future.’” What ought to concern those on the right — and anyone loyal to free market ideology — is not the ISO, Worker’s World Party, or Communist Party USA, but the growing number of people who’ve never heard of those groups reaching the same conclusion: that endless growth is incompatible with a livable planet. The People’s Climate March also represents a strategic shift. Unlike other recent climate demonstrators — XL Dissent in March, Forward on Climate in 2013, Tar Sands Action in 2011 — protesters weren’t indicting a decision-maker as much as an entire system: there’s no one president, organization or even country that can “fix” the economy. 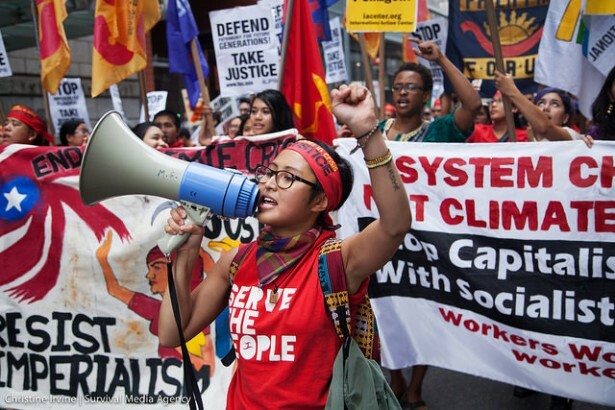 Generating the people power needed to stop the worst of the climate crisis will require a cultural shift in our relation to energy, and the creation of enough political will to take on the fossil fuel industry at the national and international level. 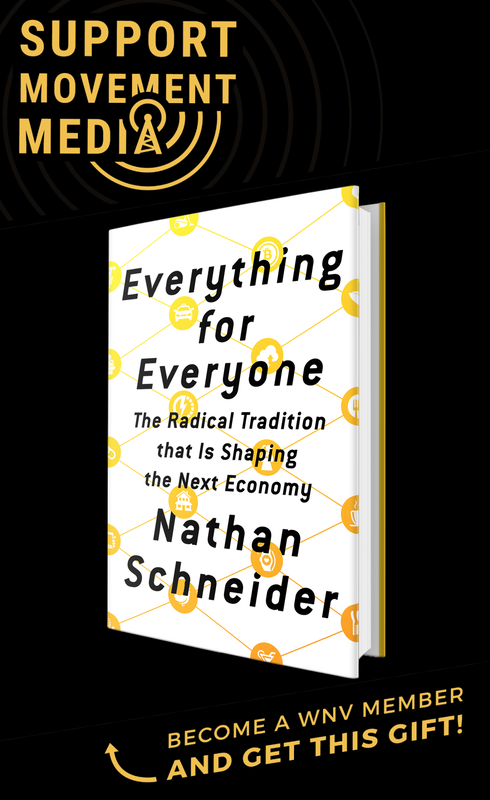 It will also demand a redistribution of industry wealth into the rebuilding of public services like welfare and education, as well as reinvestment in decentralized energy solutions that can begin to meet needs at scale. It’s not a more inclusive environmentalism that’s needed, but a mass movement that can make history and the future. “Political” will is an oxymoron. Rely on your own will, not some politicians’. @ “It will also demand a redistribution of industry wealth…” You sound like Karl Marx, whose socialism Americans have long rejected and are likely to continue rejecting. Redistribution of wealth requires a strong, even brutal, state, and if it is strong enough to take and redistribute industry’s massive wealth, it is obviously strong enough to take my puny wealth, and all together likely to do so. Heavy taxes on wealthy people and businesses have never been able to garner much revenue as compared to heavy taxes on everyone, especially the middle class which still produces most of the income. Sorry, comrade, I’ll take my chances under anarchy.